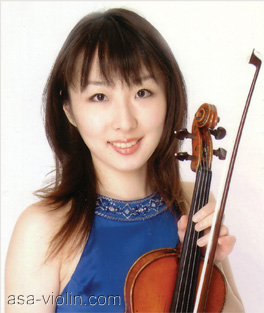 She was born in Tokyo, started the violin at 4 years old in N.Y.(US), and with Sumiko Edo, Tsugio Tokunaga at the Toho-Gakuen high school and University where she graduated, received bachelor degree in Japan. She received scholarship from Rohm Music foundation and studied the violin with Igor Ozim, string quartet with Hagen String Quartet at the Mozarteum University in Salzburg where she graduated as "Ausgezeichnet" (Premier Prix), received master degree in Austria. She was the artist of Uni Mozarteum agentur. She has also studied with Ivry Gitlis and Thomas Brandis. She appeared in the Toho Gakuen Orchestra and Mozarteum Uni orchestra as a concertmistress. She has participated the master class for chamber music of Saito-Kinen festival. Member as the opera project under the direction of Seiji Ozawa. She was awarded of Raiffeisen-Classic-Prize ('05 Salzburg), Menuhin-Memorial-Federation-Prize, Rudolf Matz international string competition ('06 Croatia), Semi finalist of International Brahms Competition ('02 Austria), 5th japan classic music competition, 5th international art league young musicians competition (Japan) 2nd prize at Wakayama music competition (Japan). She was invited as a soloist to Jeaer Philharmony orchestra (Germany), Saint Petersburg symphony orchestra (Russia) , Kiev symphony Ochestra (Ukraine), Harikov symphony orchestra (Ukraine), Marienbad symphony orchestra (Czech Republic), Dubrovnik symphony orchestra (Croatia) and so on. Ivry Gitlis admired Asa’s highly musicality and invited her to the concert of "Ivy Gitlis and his wonderful friends" in Nov. '05. It is my pleasure, and honor, to write these few words concerning Miss Asa Nakajima, Who is a lovely violinist, full of talent, musicality, and a true and sincere artist, and who deserves all the attention and encouragement on gives her. Her participation in any musical event can only enhance its value and stature.